If Bratislava was the city of statues, then Bern would be the city of fountains. Well, of statues too, since each fountain was guarded by a statue. As I walked through the old town of Bern, I started noticing them on every street, standing in the middle as if observing every passerby. 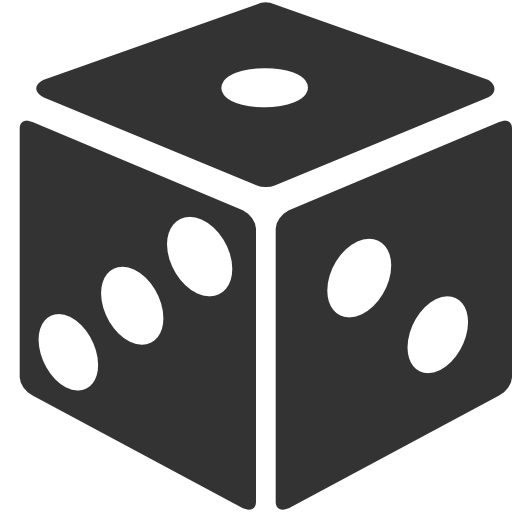 I also saw them labeled on a map of the city, spread out around Bern in various corners and intersections. So, let me introduce you to some fountains of Bern and their guardians that I have had the chance to meet. First up, the Anna-Seiler-Brunnen (or Anna Seiler Fountain). 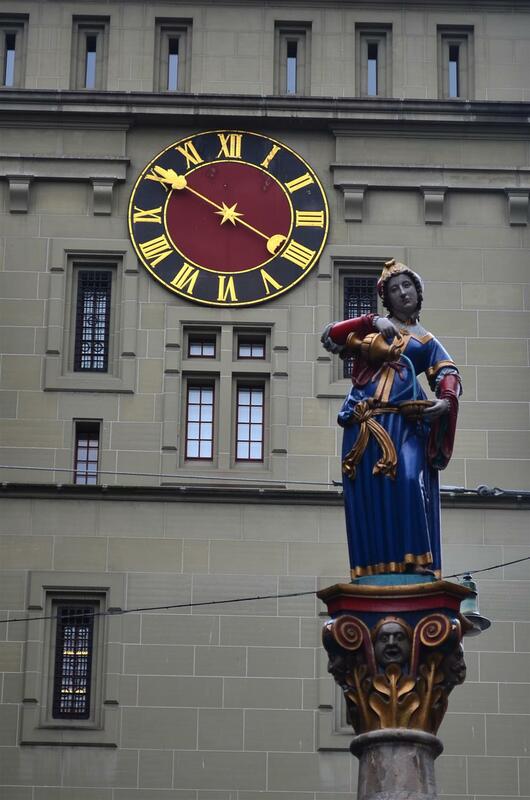 She stands in the middle of Marktgasse, the main street running through Bern, and represents the founder of the first hospital of the city. Once in a while you stumble upon a place during your travels that you’ve probably never heard of, or only planned on stopping by as a point of transfer. That was Schaffhausen for me. 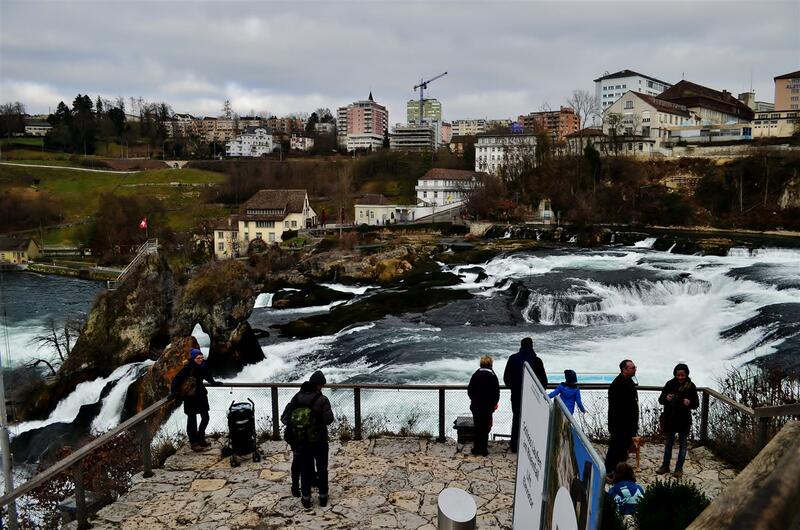 It was hard to be oblivious to Schaffhausen since it was on the way to Rhine Falls – you either go through Winterthur or Schaffhausen on your way there. Since I went by the Winterthur route (and didn’t stay in Winterthur, which was south of Rhine Falls) going towards the falls, I figured I’d take the other alternative and head north towards Schaffhausen while heading towards the next destination. Of course Schaffhausen wasn’t an actual planned stop on the itinerary, but I had an extra two hours to spare. 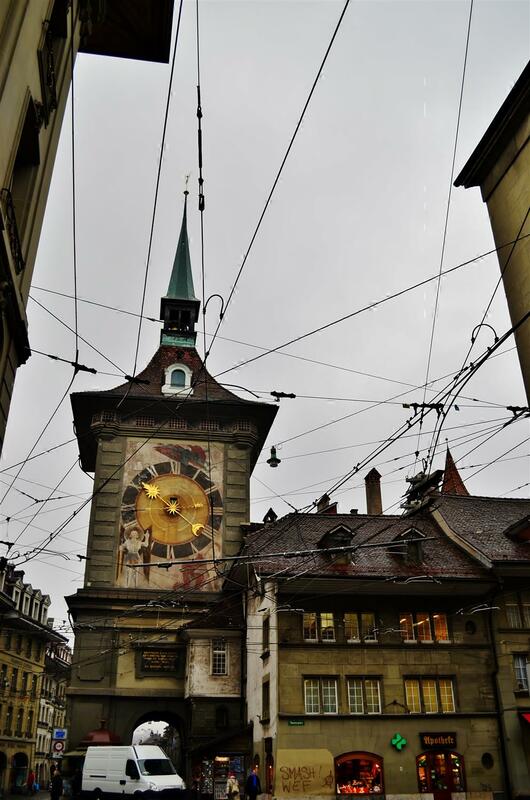 I could go to the Zurich Airport early…or explore Schaffhausen and see what I could find there. No need to guess what I did. It was a Sunday afternoon when I visited. 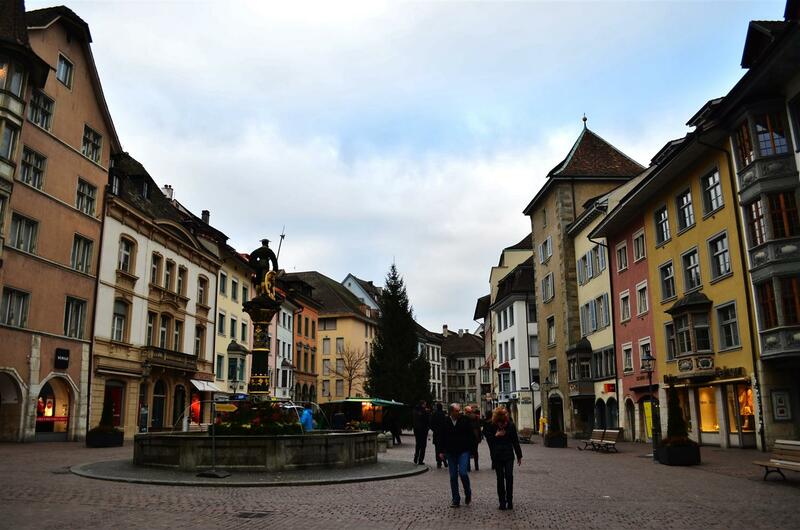 The streets of Schaffhausen were very quiet, and many shops were closed. Sometimes I wonder how many residents actually live in small cities like Schaffhausen. Somehow it gave me the impression that the city was reconstructed from a colourful painting, jumping into reality through an artist’s brush, given life by the presence of the few tourists that were around the small old town square. I love waterfalls. Being from Toronto, I’ve seen a fair share of our very own Niagara Falls, just an hour and a half away by car, but tell me the largest waterfall in Europe is in Switzerland, and you know that there’d be no way that I’d leave Europe without paying it a visit. The train stopped at Schloss Laufen am Rheinfall station, literally right next to the waterfall. As I stepped onto the narrow platform, I was welcomed by the roaring sound of the rushing waters. I only had to walk a few steps before the white waters appeared in front of me. Wow, what a sight! At one point, Switzerland began to feel repetitive. Everything is beautiful, but that’s just it – perfect beauty everywhere that’s just too perfect. A lake in every city, mountains in view at every angle, an impeccable merge of nature and cityscape. As much as I really love Switzerland, I was beginning to feel a little bored of it. I think I truly felt this after a short visit in Lucerne. Maybe that was why I didn’t stay in Lucerne (or Luzern) for more than one day. Either that, or I didn’t stay long enough to uncover its unique charm. I had previously heard exaggerated claims of how “perfect” it is, and…maybe it is, but the fog hid it the day I was there. Or maybe Lucerne really just isn’t that perfect. But then…who said anything had to be perfect to be appreciated? 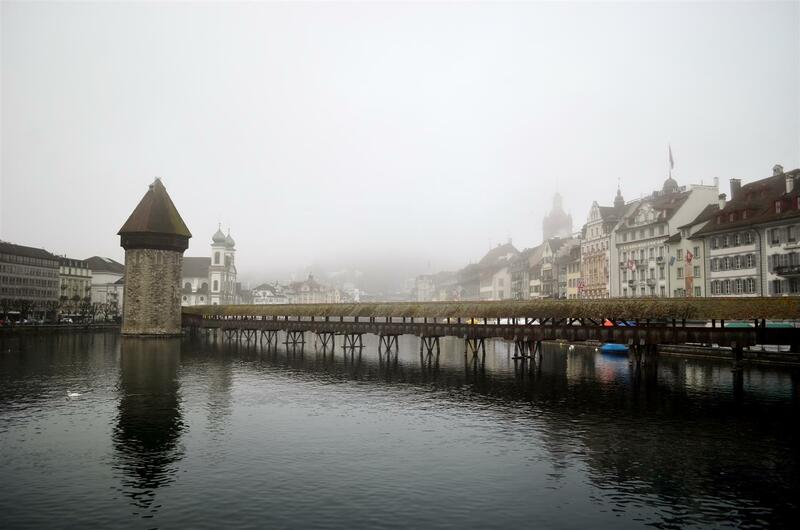 It was very foggy in Lucerne. I headed to Rigi not long after arrival, and when I came back, it was already late in the afternoon. I only had time to discover the old town districts of Lucerne, which included the covered Kapellbrücke (Chapel Bridge) and the water tower over the Reuss river.